Tucked back behind Hyannis Harbor and Lewis Bay, Hyannis is famous not only for its recreational boating facilities and convenient location on Cape Cod, but also as a past home to America's royalty, the Kennedy's. Hyannis is located on the south shore of Cape Cod due north of Nantucket, and is conveniently placed about halfway out the eastward length of Cap Cod. The image above is a view from the southeast looking northwest across inner Hyannis Harbor. The small section of land to the left (west) is Harbor Bluff, while farther into the harbor, the Nantucket Ferry Dock can be seen. Off to the right is the Hyannis Marina, which is the largest marina in the town of Hyannis. They have transient slips, gas and diesel fuel, and a lift for haul-outs and related repairs. Moorings are available behind Harbor Bluff or some boaters anchor just outside of the entrance beyond the mooring field that can be seen in the lower right-hand portion of the image. In 1602 Capt. Bartholomew Gosnold was the first of the Old World explorers to view the area now known as Hyannis. Settlers from England incorporated the Town of Barnstable in 1639. In 1925 Joseph P. Kennedy of Boston and his wife, Rose, rented the Malcolm Cottage in Hyannisport, which had been built in 1902 as a rambling clapboard home with green shutters and a private beach. Three years later, the Kennedys purchased the house and hired the original architect, Frank Paine of Boston, to remodel it. An addition doubled the size to 14 rooms and nine baths and included a motion picture theater in the basement, the first private theater built in New England. By 1932 the Kennedy family had grown to nine children, and the summer home saw the comings and goings of Joe Jr., John, Rosemary, Eunice, Patricia, Robert, Kathleen, Jean and Edward. Their days were filled with swimming, sailing, tennis, touch football and picnics. President Kennedy later spoke of Hyannisport as a special place "where no two summers were quite the same." Hyannis Harbor and Lewis Bay, which must be transited to reach the town of Hyannis, are approached from the southwest via Nantucket Sound. Although red and white Morse (A) buoy HH marks the official offshore entrance into Hyannis Harbor and Lewis Bay, most boaters navigate to waypoint N41 37.18 W70 17.47 and line up for the entry at flashing green buoy 5 and flashing red buoy 6. Once you have cleared flashing green buoy 5 and flashing red buoy 6, continue to the northeast to intercept green can buoy 7 and red nun buoy 8, and then farther on to flashing green buoy 9 and flashing red buoy 10 . After you have cleared that set of buoys from Hyannis Harbor, set a course to pick up flashing green buoy 11 and red nun buoy 12 near Dunbar Point, and then run north to green can buoy 13 and flashing red buoy 14, just to the north in Lewis Bay. The next section is a straight shot to the north where you will pick up quick flashing red buoy 18 and green nun buoy 19 just southeast of Harbor Bluff. Once you have reached these buoys, red nun buoy 20 and green can 21 usher you into Hyannis. Keep an eye out for moored and anchored boats on your approach. Cape Air/Nantucket Airlines at the Barnstable Municipal Airport services direct flights to and from Boston, Martha's Vineyard and Nantucket. There are other airlines with direct flights to and from Newark and New York. Plymouth & Brockton Bus Company provides hourly, scheduled motorcoach service between Logan Airport, downtown Boston, Plymouth and throughout Cape Cod. Charter services available. There are other bus companies providing service from New York, Providence and other locations. Full-service marine facilities are offered for pleasure craft. 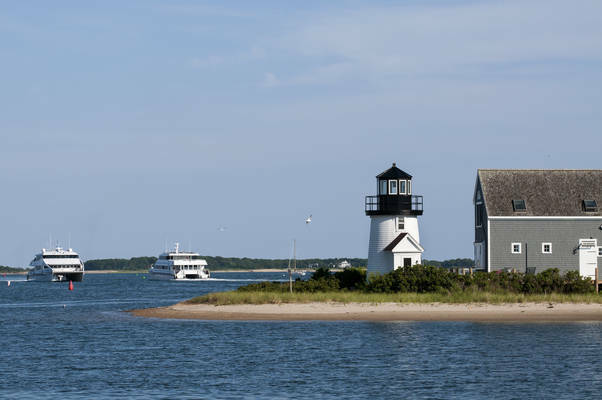 There is daily ferry transportation to and from Martha's Vineyard and Nantucket from Hyannis, on Steamship Authority or on Hy-Line (Martha's Vineyard service is available May through October). Sightseeing trips on Cape Cod Central Railroad are available Spring through Fall. Please call 888-797-RAIL. No reviews yet! Be the first to write a review of Hyannis Harbor.